While implementing the recommendations of 7th Pay Commission, Govt ensured that the commission’s pay related recommendations are accepted as such. Govt also accepted 7th Pay Commission;s innovative concept of all in one pay scale called “Pay Matrix” which caters to entry pay and pay fixation of all Central Government Employees. Consquently, Running Pay Band and Grade Pay introduced by 6th Pay Commission were done away with. Step 3. Find the cell in the level determined in Step 2, which contains the amount equal to the figure determined in Step 1. If such cell is available amount containined in the said cell will be the basic pay of the employee. If no such Cell is available in the applicable Level, amount in the immediate next higher Cell will be the basic pay of the employee concerned. 7. 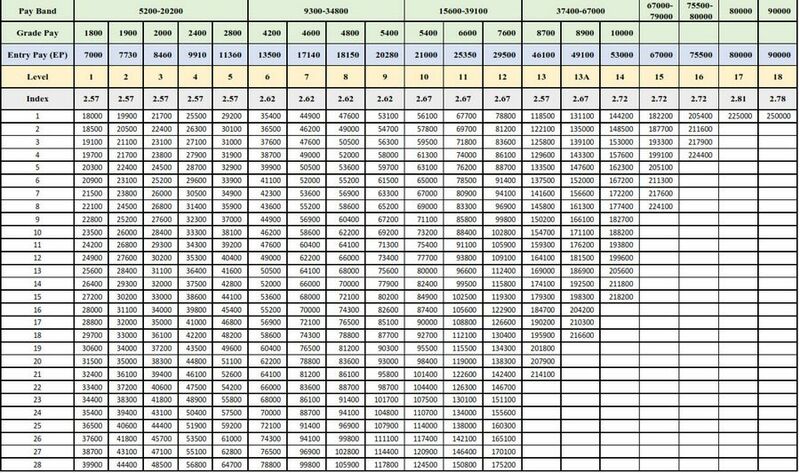 Revised Pay in Pay Matrix (either equal to or next higher to 32279 in Level 4) : 32300. 1. When Grade Pay of Post held by the employee concerned has been upgraded by Govt on the basis of recommendations of 7th Pay Commission. As per Part B or Part C of the Schedule of Central Civil Services (Revised Pay) Rules, 2016 Grade Pay of certain posts upgraded prior to 7th CPC revision of Pay. In such cases, revised pay under 7th CPC will be fixed as follows. As we all know, Medical Officers / Doctors who are serving in Central Government Service were entitled to Non-Practicing Allowance at the rate of 25% on the 6th CPC basic Pay. Pay fixation in such cases is done as follows. 3. I was on Leave on 1st January 2016. Will that affect by 7th Pay Commission Pay Fixation ? Suspended Employee will get pay revision subject to the final order in the Disciplinary Proceedings. 4. How to fix revised Pay when an employee is officiating in higher Post? In the case of an employee who is holding a higher post on a regular basis, the revised pay will be based on the pay drawn in officiating post. Govt has made provisions in CCS Revised Pay Rules 2016, to upgrade the pay of a senior who was drawing lesser pay than his / her junior in the same post prior to 1st January 2016. In such cases, the senior employee gets fixed in the revised pay structure in a Cell lower than that of such junior, his pay shall be stepped up to the same Cell in the revised pay structure as that of the junior. 5. How to apply 7th pay Commission Pay Matrix in the case of Employees appointed on or after 1st January 2016? Central Government Employees who are appointed on or after 01.01.2016, will be fixed at the minimum pay or the first Cell the level applicable to the post in which the employee concerned in appointed. Annual Increment for Central Government Employees will be paid by granting the amount specified in the cell, which is veticallly next downwards in the same level of pay, as the Basic Pay after grant of annual increment. Considering the complaints of Staff Side Federations and Unions in the delayed annual increment due to one fixed date of annual increment prior to implementation of 7th Pay Commission, viz., 1st July 2018, Govt decided to grant annual increments in two dates, during 1st January and 1st July of every year. The Date of annual incrememt will be decided depending on the date of appointment, promotion or grant of financial upgradation in respect of the employee concerned. The increment in respect of an employee appointed or promoted or granted financial upgradation including upgradation under Modified Assured Career Progression Scheme (MACPS) during the period between the 2nd day of January and 1st day of July (both inclusive) shall be granted on 1st day of January and the increment in respect of an employee appointed or promoted or granted financial upgradation including upgradation under MACPS during the period between the 2nd day of July and 1st day of January (both inclusive) shall be granted on 1st day of July. If an employee is promoted on or after 1st January 2016, Pay Fixation on Promotion will be made as follows.